The Animal Land installation uses video projections to generate synthetic animals, native to each geographical location, that are devoid of natural context. Environmental storytelling can be more than the menacing drumbeat of global threats that dominates news cycles. A new era of stories for our changing planet will debut Oct. 18–20 at UCLA’s Earth Now: Earth 2050, a three-day symposium at the recently opened UCLA Meyer and Renee Luskin Conference Center. The event marks the official launch of LENS — the Laboratory for Environmental Narrative Strategies — an incubator for narrative strategies that drive efforts for a more sustainable world. 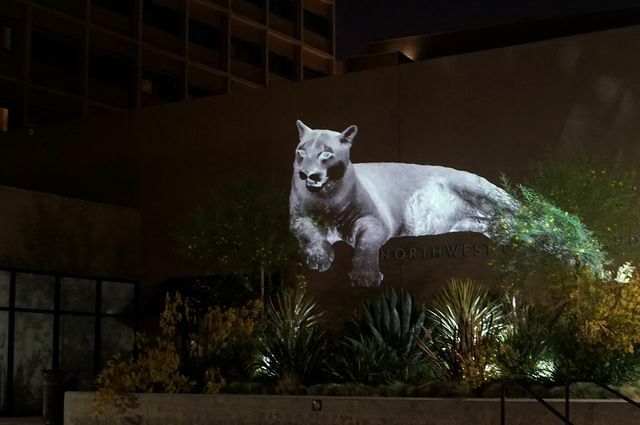 The coming-out party takes place Oct. 20, the final day of the event, but students may feel something looming a few days prior, as giant images of animals from the surrounding habitat are projected on buildings in Sunset Village for “Animal Land,” an art installation. The kickoff includes immersive public art, the launch of a new magazine, a software-driven animation, and an exhibit on the cultural politics of water in the Everglades, said LENS co-founder Jon Christensen. 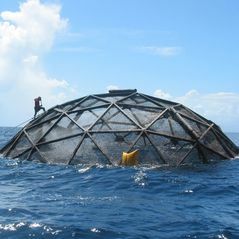 “It’s going to be a big bang celebration of this new thinking about the crucial role narratives play in the changes we need to thrive on Earth,” Christensen said. To that end, the program will showcase faculty and student projects along with talks and discussions with prominent environmental writers, thinkers and artists. And, thanks to an alliance with the Center for the Art of Performance at UCLA, an original video artwork by Lars Jans will be unveiled during an after-party at the UCLA Fowler Museum. Meryl Friedman, director of education and special initiatives for CAP UCLA, said she looks forward to continued partnership on environmental projects. “It could be a role model for how other organizations, groups and artists can work together,” she said. Earth Now: Earth 2050 may be the official debut of LENS, but the project’s roots stretch back more than a decade, when co-founders Allison Carruth and Ursula Heise formed an environmental humanities group for students and faculty. “Our goal is to be an incubator for innovative questions that cross between the humanities, social sciences and environmental science,” said Carruth, faculty director of LENS. In addition to breaking down academic silos, LENS seeks to get undergraduate and graduate students working together on projects. The hope is to train a new generation of environmental thinkers, scientists, leaders and storytellers in the tools of multimedia narrative and communications — things such as video games, podcasts and data visualizations. LENS will also work to integrate narrative and storytelling with the research process. “One of the things driving LENS is — in this kind of open-access and open-source mode — to have research be something that is experimental and public-facing,” Carruth said. That means engaging external groups, officials and decision-makers in the process, and not focusing exclusively on peer-reviewed scholarship as the product of research. As an example, she pointed to Christensen’s research on Proposition 84, a 2006 California ballot measure to build parks and other environmental projects. Despite language that prioritized funding for urban, disadvantaged and park-poor communities, Christensen found that parts of the bond measure failed to deliver on those aims, likely because they weren’t specific enough. He presented the findings to legislators in Sacramento, where it has already influenced potential future laws and initiatives. Los Angeles may be the perfect location for communications-based environmentalism, with its multiculturalism, civic arts and entertainment industry. LENS has already joined forces with museums, studios and artists, and Carruth expects to build even more relationships in the future. 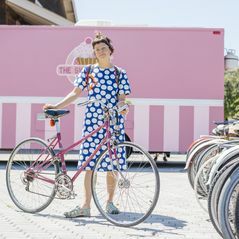 “The kind of collaboration we’re doing at the conference is something we see as ongoing and that taps into the rich public art tradition in Los Angeles,” she said. The three-day symposium is free with reservations, which can be made online. Then, in November, LENS takes its show on the road to the La Brea Tar Pits for a ;conversation about extinction and endangered species. 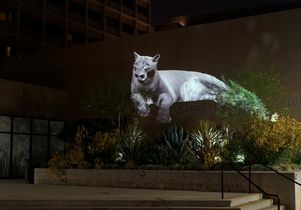 Image of mountain lion projected onto the side of a residence hall at UCLA that’s part of the Animal Land installation.